Impact NW believes that parents are a child’s first and most important teacher. Yet low-income parents do not often have the time and resources they need to encourage their young children’s healthy growth. Our Parent-Child Development Services program was designed to help struggling parents find the support and develop the skills they need to support their children’s learning and development. We help bring families closer together while empowering parents to ensure a bright future for their children. 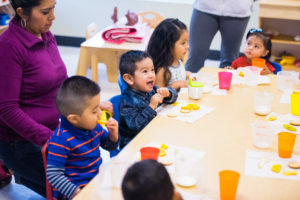 Parent-Child Development playgroups allow parents to engage in fun, interactive classroom activities with their children and to learn about topics such as nutrition, child development, and positive parenting skills. Our playgroups are held at Brentwood-Darlington Community Center and in schools throughout SE and SW Portland. Families receive free home visits, immunization checks, and developmental screenings to make sure their children are happy and healthy. For children between 3 and 5 years of age, we also focus on school readiness and social skills. Our program receives funding from the Portland Children’s Levy, Multnomah County, Spirit Mountain Community Fund, and United Way. Please call our Parent-Child Development Services program at (503) 294-7387 to learn about our range of services. Your conversation will be completely confidential. If Impact NW isn’t the best fit for you, we’ll help connect you to the services you need.